The Murray River is all New South Wales water and NSW regulations apply. A NSW fishing licence is required when fishing in the river, even if the angler is standing on the Victorian bank. A Victorian Recreational Fishing Licence is not valid for angling in the Murray River with the exception of Lake Hume. As from 1 September 2004, The Victorian Fisheries Authority manages recreational fishing in Lake Hume while the NSW Department of Primary Industries (DPI)-Fisheries manages recreational fishing in Lake Mulwala. The Murray River rises as three, clear, springs at Forest Hill (40km south of Mt Kosciusko) in rugged mountains (1,800m altitude) then flows for 305km to Hume Lake, mostly through undulating farmland or open country and several areas of mixed low forest. It then flows for another 2,225km to South Australia and the sea. Its flow downstream of Albury is regulated by releases from Lake Hume. Lake Dartmouth, on the Mitta Mitta River, is the other large reservoir in the catchment which supplies water to Lake Hume. Downstream of Lake Hume the river flows through a section of low hills in the Kiewa Basin then through flat terrain to South Australia. The land adjacent to the river is all cleared farmland apart from two extensive areas of red gum woodlands around Barmah (Broken River) and Koondrook to Murrabit (Loddon River North). Along the whole length of the Murray River, bank erosion is quite common because of the frequent changes in flow and therefore water level. Assessments by the Department found that from 16% to 61% of the total bank length in different localities from the upper Murray to Mildura showed signs of erosion such as silt deposits, and undercut banks. However there is little sedimentation in the channel. The water level is controlled by releases from Lake Hume and the numerous dams and weirs downstream. Fishing is greatly influenced by the resulting fluctuations in flow and changes in water level. The upper reaches rise in forest but most of the river flows through cleared open country then through farmland downstream of Towong. Access is good in the lower section and there is good camping along the river. Riparian vegetation is scattered red gums, grass and willows. The river is 40-50m wide, with most pools 2m deep although there are some reaches with pools 4-5m deep. The banks are generally stable with no serious bank erosion or instream sedimentation occurring. Downstream of Hume Lake to Yarrawonga, the river flows in a channel, averaging 50m wide. The banks are 3-5m high and there is a continuous line of riparian vegetation of mostly mature red gums along both banks. There is a scarcity of instream debris which reduces its value as habitat for Murray cod and golden perch. Substrate is predominantly clay with patches of gravel. Water depth from Yarrawonga to Torrumbarry averages 3m with numerous deeper pools or holes averaging 4m with some 6-8m deep. Channel width can be up to 100m. There is an abundance of snags in the river downstream of Yarrawonga with logs exposed along the edges at low flows. There are extensive large sandy beaches along the edges of the river. Riparian vegetation is still a continuous line of mature red gums and bank height varies from 3-5m. The river structure downstream of Torrumbarry to Mildura is similar to upstream but there is an area of shallower water (1-3 m) with some deeper holes for a distance of 100km downstream of Torrumbarry. Only a very brief outline of fishing opportunities are listed below. Vehicle access to the river is excellent except in the section Tocumwal to Barmah. There are numerous boat ramps although not all are concrete or stabilised with rock. Although bank fishing is quite possible and rewarding, the best fishing is from a boat, which enables access to midwater snags and the use of trolled lures which are very successful in taking Murray cod and golden perch. The best fishing appears to be during a period of stable flow after an increase in flow. Murray cod and golden perch (yellowbelly) are the main target species of most anglers. Other species taken are carp, redfin and Murray spiny crayfish. Fish present in the river are Murray cod, golden perch, trout cod, silver perch, freshwater catfish, bony bream, blackfish, carp, redfin, goldfish, western carp gudgeon, flat-headed gudgeon, Australian smelt, southern pygmy perch, Murray hardyhead, oriental weatherloach and mosquitofish. Three species of freshwater shrimp are present as well as yabbies. There is extreme variation in fishing success at different times and locations. Anglers are therefore advised to obtain more detailed information from angling publications, local fishermen and detailed maps which show access roads and launching spots. Carries brown trout and rainbow trout to 1.5kg. Murray cod 2-6kg extend upstream as far as Towong Upper but are more abundant upstream to Walwa. Fishing for Murray cod in this area is best in spring and early summer. Redfin to 1.3kg are common upstream to Walwa. Some goldfish and tench can be taken in slow flowing areas. Murray crayfish are present on the mud bottom. Note that Murray crayfish in the river upstream of 7 Mile Creek above Lake Hume to the road bridge at Tintaldra can only be caught legally using rod and line. Hoop nets, dip nets, any type of lift net or trap are prohibited upstream of Lake Hume. Other regulations also apply. Note that the Murray River upstream of Tintaldra is classified as a general trout water and is closed to all fishing from Monday midnight of the June long weekend to Friday midnight immediately prior to the October Labour Day long weekend in NSW. There is generally a bag limit of 5 trout with 10 in possession. Only one attended rod and line with no more than two hooks attached, can be used. There are a few exceptions. Check with NSW Fisheries, Albury, (02 6042 4228) for current regulations. There is a total closure to all fishing methods from the Hume Weir dam wall downstream for 130 metres. The main difference in this section compared to further downstream is the scarcity of debris on the substrate. This together with the colder water released from Lake Hume has resulted in fewer Murray cod in this section compared to downstream of Yarrawonga, although some fish to 30kg are caught. The section of river below Hume Lake provides good fishing in the spring for brown trout to 4kg. The section from Yarrawonga Weir to Tocumwal Road Bridge is closed to all forms of fishing from 1 September to 30 November. The section of river downstream to Cobram carries mostly small (3kg) Murray cod and some very large fish over 30kg. Surveys by the Department have found a lack of fish between these sizes. Further downstream large (30kg) Murray cod are common. Other fish are carp, redfin, Murray crayfish, golden perch, silver perch and freshwater catfish. Note that silver perch and frershwater catfish may not be taken from the Murray River. This section also contains trout cod but these must be released alive (see regulations in section on trout cod). A well-known and popular fishing area is the 'Black Hole' just downstream from Yarrawonga, where good catches of golden perch have been made. There is a boat-launching ramp in the Yarrawonga Caravan Park. This is a popular section of river for camping and boating and has excellent sandy beaches. Access is good and there are good boat ramps available. There is abundant debris and deep water (4m) which provides good fishing for Murray cod and golden perch. Carp and redfin to 1kg are most abundant. There are some Murray cod to 15kg, silver perch (protected), golden perch and good numbers of small Murray crayfish. Best fishing around Barmah is during periods of stable flow. Snags are abundant and a boat makes fishing and landing fish easier. Although this is a busy section of the river with boat traffic from Echuca there are plenty of deep water gutters and pools which provide excellent fishing. The Goulburn and Campaspe Rivers enter this section of the Murray River and fishing is good in the river mouths. (Golden perch at the Goulburn River mouth and redfin at the Campaspe River mouth). There are two public boat ramps at Echuca East and Victoria Park in Echuca. Fish present are, carp, numerous Murray cod with some fish to 45kg, redfin and Murray crayfish. Also some silver perch, freshwater catfish near Murrabit (protected), goldfish and tench. Golden perch are not as abundant as upstream. Murray cod fishing is excellent upstream of Torrumbarry (located 25km from Echuca) with numerous deep pools and snags. There is a good boat ramp at Torrumbarry Weir. There are extensive areas of shallow water further downstream to Swan Hill but some fishing is still available in deep gutters and pools. Fishing around Swan Hill was good in 2002 although it had been quiet in the preceding years. The river becomes wider and flow becomes very slow because of the numerous lochs and weirs. Downstream from Mildura, water depth increases to an average of 5-6m. Although red gums are still present along the banks the surrounding land becomes semi-arid with salt bush further downstream. There are very large Murray cod to 50kg around Robinvale with best fishing reported to be in December. However fishing success is very dependant on water levels with little fish movement until water level rises. Other fish are carp, redfin to 2.5kg, good numbers of silver perch to 5kg (protected), freshwater catfish (protected), tench and some golden perch to 2kg. Murray crayfish are scarce. Ned's corner and Lochs 7 and 9 are popular fishing spots. Murray cod commonly range in size from 5-22kg although fish up to 113kg have been taken. Although Murray cod are not as abundant as in earlier years, they are still common in the Murray River and relatively easy to catch. Their preferred resting habitat is on the substrate close to debris or snags (submerged timber/logs/branches) and particularly, large clumps of submerged debris. Research by the Department found that 80% of fish monitored with radio tracking devices were resting within one metre of debris. Most (74%) resting sites had more than 50% of the area covered with debris. Murray cod use these snags to shelter from water velocities and from where they can ambush their prey. Fish can occur in shallow areas with quite fast surface water flow, provided debris is present. The Department found that Murray cod were most often found resting in water more than 2m deep. However they had no particular preference for the deepest holes or pools. The Department also found that fish tend to move closer to the banks and also to utilise submerged bank vegetation for protection from high water velocities, during high flows. Murray cod are sedentary during the year but from about August to early November, (depending on seasonal flow conditions) they migrate upstream to spawn. This migration appears to be triggered by high flows or floods. The Department has tracked fish moving up to 100km upstream from Lake Mulwala. After spawning in the rivers, all fish move rapidly downstream, taking up residence again in the same location and even by the same snag, they had previously occupied. The Department recorded one fish moving 90km in 20 days. An understanding of the types of habitat that Murray cod prefer can assist anglers in their fishing efforts. Best fishing spots are close to snags or even better, close to large clumps of snags. Most fish are taken by casting or trolling lures at a fast rate (fast walking speed). There are numerous lures but one worth starting with is the Stumpjumper. Quite large lures can be used to catch even small Murray cod and golden perch. Most lures are 'bibbed' with a plastic plate in the front, which causes the lure to dive and also provides a particular 'action'. The very best bait is bardi grubs, but yabbies, worms and balls of shrimp can also be used. Some anglers find that baits are good at higher flows when the water may be discoloured and lures are more successful when the water level drops. In NSW (including the Murray River) and Victoria in 2002 there is a closed season for taking Murray cod from September to November, inclusive.Anglers report good fishing is still available right up to the start of the closed season. The minimum legal size limit in Victoria is 50cm and a bag/possession limit of 2 (of which no more than one fish may equal to or exceed 75cm in length). 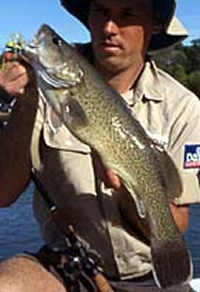 From 1 December 2007 the minimum legal length of Murray cod in NSW will be increased to 55cm, followed by a further increase to 60cm on 1 December 2008. The bag limit for Murray cod in NSW is 2 per person per day with only 1 fish over 100cm allowed. Set lines are prohibited in all NSW waters Check current regulations before fishing. Trout cod were once widespread in the upper Murray River but are now common only between Yarrawonga and Tocumwal, surviving as one of only two self-sustaining populations in Australia. The other is a translocated population in Seven Creeks, Victoria. Most fish in the Murray River are 350-880g but some fish to 5kg have been caught. Trout cod has been listed as a threatened species under the Victorian Flora and Fauna Guarantee Act 1988 and are listed as endangered under the Federal Environment Protection and Biodiversity Conservation Act 1999. The possession of Trout cod is prohibited and any fish caught must be returned to the water alive. ALL FISHING is prohibited during September to November inclusive within the Trout Cod Protection Area, downstream of the Yarrawonga Weir (weir at the outlet of Mulwala Lake) to the Tocumwal Road Bridge. Check with NSW DPI Fisheries for complete current fishing regulations. Bait fishing anglers should cut the trace above the hook and release the fish. Attempts to remove the hook can damage the fish. 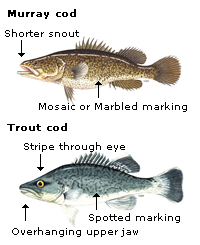 Trout cod can be confused with Murray cod and the following distinguishing features are provided to assist in their identification. Body colour is generally blue-grey on dorsal surface becoming paler, almost white on ventral surface. Body has dark spots and irregular dashes or bars with few markings on forehead and snout. Jaws equal length or bottom jaw protrudes. Colour pale green to creamy yellow sometimes golden on dorsal, becoming paler more creamy white on ventral surface. Larger fish can be blue-grey. Body has mottled pattern extending onto forehead and snout. Can be finely speckled in large fish. Golden perch (yellow belly or callop) are common throughout the Murray River. They can reach 20kg in weight but are usually less than 5kg. They can tolerate water temperatures to 37°C and salinity almost that of salt water (56,000EC). Their preferred habitat is warm, sluggish, turbid water, also shady or weedy locations, often in very shallow water. They rest among snags and also along the bank in areas of slow-flowing water out of high water velocity areas. Adult fish move long distances upstream to spawn during September-December and this is triggered by a rise in water level at the start of major flood events. Fish have been recorded moving 1,000km within the Murray-Darling Basin. The construction of weirs on the Murray River interrupted their spawning run resulting in a loss of fish in the Murray River and in the Ovens River upstream of Lake Mulwala. Stocks in these waters and in Lake Hume are now maintained by stocking hatchery-bred fish. Golden perch are carnivorous, taking mainly crustaceans, insects, molluscs and small fish. They can be caught on baits such as live yabbies, worms and shrimps. They also strike well at lures. Popular lures are up to 10cm in length and coloured yellow, red or green. Inquire at the closest angling shop for local information as to the best lures to use at that time. Legal length of fish is 30cm, and there is a bag limit of 5 fish per day in the Murray River. A Possession Limit of 10 applies in NSW Waters. In Victoria and NSW silver perch may only be taken from dams and impoundments. They prefer slightly faster flowing water than Murray cod or golden perch. 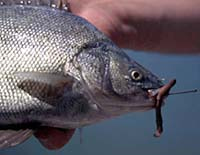 Any silver perch caught in the Murray River must be returned carefully to the water. In dams, best taken on baits such as worms and shrimps. Freshwater catfish are protected and may not be taken by any methods in the Murray River and its tributaries within NSW. Any freshwater catfish caught in the Murray River must be returned carefully to the water.Not commonly taken in the Murray River but possibly caught in billabongs and areas of sluggish or still water out of the current of the main channel. The adults are usually solitary fish whereas juveniles form loose schools. They do not migrate but remain in the same locality all their lives. An area fished out of freshwater catfish can take some time to be recolonised. They prefer a weedy area with mud substrate and live and feed on the substrate. They are most active at night. Murray crays are common in the Murray River upstream of Robinvale. Best baits are meat offal or a piece of any fish. 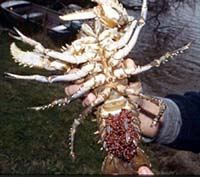 The section of river between Barmah to Echuca is reported to provide good fishing for Murray crays. Murray crays are in best condition for eating after mid June.